Greenpeace Canada and the Pembina Institute have put their names on; Renewable is Doable: Affordable and flexible options for Ontario's long-term energy plan (LTEP). The document is primarily about criticizing nuclear generation in Ontario, and presenting, "good reasons for Ontario’s next LTEP to keep the province’s options open and not lock into nuclear." Renewable is Doable basically presents 2 arguments: we don't need new nuclear, and it would be better to build a "cost-effective, low-carbon energy mix" instead of the new, not needed, nuclear units. That's a negative aspect of a large nuclear component. Greenpeace and Pembina put a lot of emphasis on forecast from the the Ontario Power Authority (OPA) and the Independent Electricity System Operator (IESO) - particularly ones that required freedom of information requests to acquire. Having worked with historical data from a number of sources,tracked the demand trends as best as possible, and reviewed past forecasts, I don't have much interest in the forecasts of either entity. Annual demand has been ~142 TWh (million megawatt-hours) since 2009 and peak summer demand ~25,000MW since 2008. From 2005 through 2009 the drop in both demand and peak demand came primarily from the wholesale sector - likely due to an industrial sector and driven by the rapid increase in rates from 2002-2005, and an increasing value to the Canadian dollar. In recent years changes have been make to the global adjustment scheme to give large wholesale customers the opportunity to lower rates - likely producing an incentive to run generators during peak demand hours instead of consuming power off of the grid. Failing convincing arguments on why demand would change, the safest assumption is that it won't - up or down - regardless of statements from lettered organizations (or people). Chapter 1 in 'Renewable is doable' is "Putting conservation first in the long-term energy plan." Conservation has an inherent appeal, and as such people mention it frequently without understanding the cost implications, or the history of conservation efforts. This Greenpeace (and Pembina) document pretends conservation efforts haven't been key initiative for years , but the Ontario Power Authority (OPA) was created as a planning agency; it has since become largely a conservation agency - in 2012 the OPA spent $59.3 million in operating expenses and $301.1 million on conservation programs. Unfortunately, electricity is not actually what is conserved (it's rather expensive to save it for later), and there is already a law about conserving water (a scientific one); coal is being phased out; our minimal biomass joins wind and solar as renewable, and that really leaves uranium and gas as things that might be conserved in reducing electricity consumption. One issue with the payback on reducing electricity use that minimizes gas-fired generation is the capacity trap Ontario created for itself by offering net revenue requirement contracts. Currently, even at a cost of 3 cents/kWh, Ontarians lose in purchasing conservation. That is not due to nuclear, but variable renewable energy sources (vRES). Analysis conducted by the OPA in 2012 shows that it is cheaper to build new gas plants at current prices than to refurbish the Darlington or Bruce nuclear stations. The analysis in this report also shows that at 10 cents per kWh, a portfolio of conservation and green energy is also competitive with nuclear refurbishment. The 450MW of "additional efficiency and conservation" is shown as producing full out 24X7 all year long to get to 3,942GWh - that's not a serious estimate of anything. Discounting this frivolous negawatt total, and assuming hydro location might be found to produce at the average 36% the total production drops to 9951GWh, and the average cents/kWh rise to 14.19. Darlingon's actual capacity factor is far higher than the 85% used to make renewable doable ... it's been 91% over the past 3 years (and 96% in the months of July; 98% in the months of January). If we let the claim on "Combined heat and power" go, the prices become about the same, but to get those prices the new build option needs to produce about 16TWh a year while the renewable is doable option only needs ~10 TWh to get to that price. But we can't let the implied claims on "Combined heat and Power" component go at an estimated 8.5 cents/kWh - or any other price. Dwight Duncan, as Minister of Energy in the early years of the McGuinty regime (2003-) designed and implemented a hybrid system where "Fixed prices for a large part of the energy consumed in the province would keep the overall blended price for electricity relatively stable.”  The fixed prices were on the public generator's large legacy hydroelectric stations, and it's nuclear units. In 2013 generation from Darlington's nuclear units is reported to be receiving 5.7 cents/kWh, while the NUGs churn away at rates likely far more than double that. Newer combined heat and power projects are not so cheap as that it is often suggested that combined heat and power is very cost effective, very easy to do and there is a lot of potential for it. This competitive RFP was for 1,000 megawatts. They ended up only getting 414 megawatts of responses, so those were all taken. In terms of the cost in that plan, they ranged. The cost of the products procured ranged from about 11.5 cents up to about 24 cents a kilowatt hour, so these are quite expensive projects. There have been negotiations with some individual proponents since then. They would tend to be at the higher end of that range. Certainly the claimed 8.5 cents/kWh in "Renewable is Doable" isn't realistic; neither is the implied 80% capacity factor. The "Green Portfolio" portfolio presented by Pembina and Greenpeace has, basically, 300 MW of dispatchable generation for 2200 MW of vRES capacity - so when it's windy or sunny, the CHP isn't likely to be operating efficiently. To utilize CHP efficiently, clients are required for electricity, and for heat. This explains the variety of project pricing. It dosn't explain why CHP would be added in a summer peaking jurisdiction, which Ontario is - or how it would achieve a high utilization rate without an industrial client for the steam. Renewable is doable does provide an estimated cost for new nuclear - one I'd expect is high, but not inconceivable. It does not provide a properly costed and realistic alternative. Renewable is Doable contains the word carbon 6 times; always within a hyphenated term, "low-carbon." Low-carbon is usually a shorthand for gas. Renewable is Doable contains another set of words 6 times: "Jack Gibbons." Jack Gibbons is the principal at the Ontario Clean Air Alliance (OCAA) - another nominally non-governmental organization that seems to leverage donations from the gas industry to procure government funding (as does Pembina). Anthropogenic global warming/AGW/Global warming isn't in the document. Renewable is doable does note "greenhouse gas (GHG) emissions" twice; once in noting how they went up when the government took 7 nuclear units off-line late in the 1990's, and once in noting how they might rise during refurbishment outages at Darlington. If Bruce units are removed emissions will rise. If 2000MW of nuclear capacity aren't built to replace the 3000MW at Pickering, emissions will rise. International emissions aren't only lowered by CANDU technology in Canada, but in Argentina, Romania, China, Korea and India. All of these units, including India's domestic heavy-water reactors, flowed from a choice to develop nuclear energy here, in Ontario. The analysis in the Greenpeace/Pembina/Ontario Clean Air Alliance report does not take environmental externality costs into account, exposing the non-environmental non-governmental organizations as common lobbyists. Their "portfolio of conservation and green energy" is not properly costed for Ontario, and does not provide the necessary firm capability to meet peak demand in winter, or the other secondary peak on summer evenings. Cost, and cost overruns are a valid concern, but if cost really is a primary concern it must be noted the cheapest electricity contracted in recent years are the refurbished/reworked models at Bruce A - as well as emphasizing Darlington's output remains far cheaper than the private, primarily gas, supply contracted from non-utility generators around the same time Darlington was under construction. 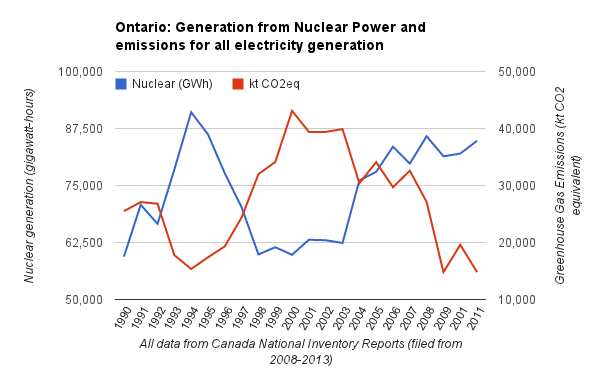 It's also a reality that if present trends continue Ontario will have periods of excess generation if today's 13,000 MW of nuclear capacity is reduced to 12,000MW. If present trends continue summer peaks will likely also rise along with the widely expected increase in temperatures. If more processes are electrified, Ontario will contribute less to the atmosphere's greenhouse gas component. In 2011 Ontario reportedly emitted 14,800kt CO2e in generating electricity - less than the 20,000CO2e emitted in residential uses (ie. furnaces, water heater), and far less than the 45,300 kt CO2e from road transportation. If Ontario is considering the environment in a Long Term Energy Plan, the discussion on energy needs to be broadened beyond how to constrain electricity usage. The Darlington new build may be a questionable proposition if the discussion is only about what we expect is going to happen to us. If the discussion becomes about the things we know how to accomplish that contibute to the changes we want to make, we will want more processes electrified. We should want as much electricity to come from the clean baseload created with a technology developed domestically; one which has put us in a position where the intensity of our emissions from electricity is a fraction of that in the far more expensive states NENGOs would have us emulate. 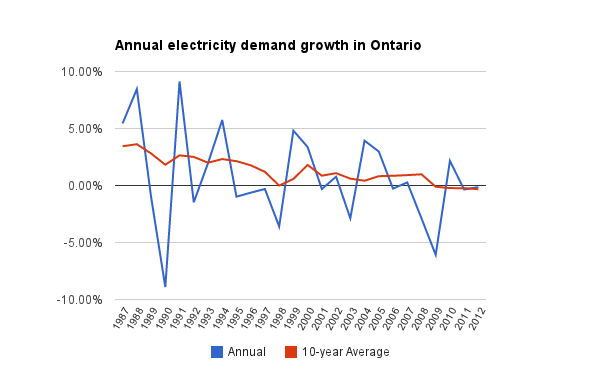 This is not an "apples to apples" comparison as the metered data would, presumably, not include line loss and the IESO's reporting of Ontario Demand isn't really reporting demand, but supply (thus including line loss). 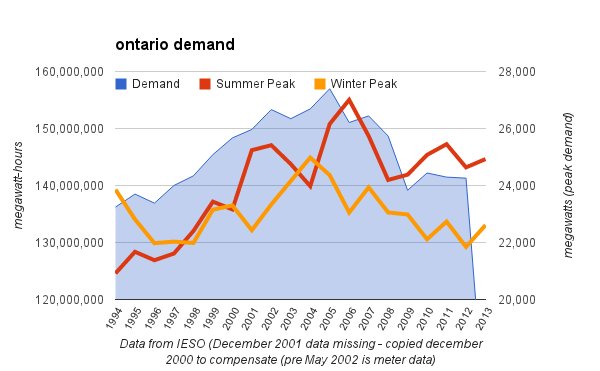 Compounding data integrity issues, December 2001 was omitted from the metered data set (so I copied over December 2000's total for estimating), and, particularly, the IESO's data quality has been rapidly degrading with the growth in embedded generators - generation that displaces the requirement from the gnerators on the IESO system, and therefore that generation shows as declining demand . For another view of demand changes see this chart created for Stranded Debt, Abandoned Responsibility. One reason to disrespect the IESO's forecasting abilities is their historical provision of low summer peaks under normal weather peak. For instance, they forecast 22834MW as a normal weather peak for 2014 after forecasting 23,103 as a normal weather peak for 2013's summer last September. That was exceeded on 5 days, with the peak on July 17th. The failure is likely that normally July 17th would not be so hot as to demand 25000MW - but some day in July/August would usually be warmer than it usually is, and demand close to 25000MW. Mr McGuinty: You must be aware that the coalition of environmental groups made up of Friends of the Earth, Greenpeace and the Nuclear Awareness Project are strongly opposing your appointment as chairman. I have a letter here dated 2 April 1991 to the Premier and they say, second paragraph, "Mr Eliesen has publicly taken a fundamentally pro-nuclear, anti-conservation position, and has been notably inactive in pursuing the government's proconservation and nuclear moratorium policies." They go on to say, "He has spurned meaningful public consultation." Presumably the "proconservation and nuclear moratorium policies" were the NDP's, under then Premier Rae. The NUG were responsible for 22% of the unfunded liability - and I would guess 6-7% of annual generation. Mr. Jennings, over the past several days since you came and spoke to us and gave us your overview of the way the plans for development of energy resources and electrical generation resources in Ontario were put forward, we’ve had interventions from many of our intervenors concerning decisions on energy choices and the energy mix going forward, and the scope of the application brought forward by Ontario Power Generation. And we made reference, on more than one occasion, to the information that you presented to us. But the concern on the part of many intervenors is that they did not see the rationale for the alternatives being proposed for the energy mix and on the true need for nuclear generation as opposed to alternatives. So with that as introductory remarks, we’d like to get from you your perspectives on how the decision to go with nuclear as opposed to other choices was reached for the long-term? Amir Shalaby, of the OPA, delivered a presentation late in 2012 which showed a forecast for 2015 including only 9 TWh from natural gas (slide 8); the 2.3TWh indicated for CHP in Renewable is Doable would not operate efficiently - at CCGT emission levels it would add about 25% of that figure.